WASHINGTON – It’s no secret that President Donald Trump is not a fan of the late Sen. John McCain, but instead of weakening the McCain fan club the president’s latest string of attacks may be having the opposite effect. Republican senators have come forward to defend their former colleague, Senate Minority Leader Chuck Schumer has dusted off a proposal to rename a Senate building in McCain’s honor, and analysts are left wondering what good Trump thinks will come of it. It’s all in response to several days of attacks on the Arizona Republican that began Saturday with a Trump tweet accusing McCain of being behind the special counsel’s probe of possible Russian meddling in the 2016 election. That was followed by more tweets in which Trump mocked McCain for finishing near the bottom of his Naval Academy class and brought up McCain’s dramatic 2017 thumbs-down vote that preserved Obamacare. 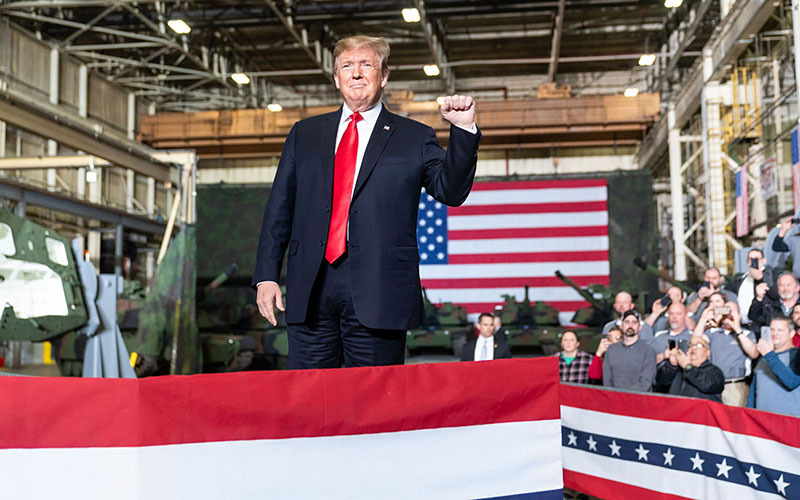 It culminated Wednesday with a speech at a Lima, Ohio, tank factory where Trump, without prompting, veered off script in a speech about defense spending and manufacturing jobs to complain about McCain. What followed was five minutes in which Trump repeated the Naval Academy and dossier claims, again brought up the Obamacare vote, criticized McCain’s support of U.S. involvement in Middle East wars and complained that he was never sufficiently thanked for his role in McCain’s funeral – approving the use of a plane to carry the casket from Phoenix to Washington. Trump also raised a new complaint, that McCain “didn’t get the job done for our great vets” by improving medical care at the Veterans Administration. “The vets were on my side because I got the job done. I got Choice and I got Accountability,” Trump said. But the Choice bill, which lets vets seek treatment outside the VA, was sponsored by McCain and Sen. Bernie Sanders, I-Vermont, and signed in 2014. An update to that bill, which Trump signed in May, is actually named for McCain and two other vets who served in Congress. It was the only part of the speech that everybody might agree on. 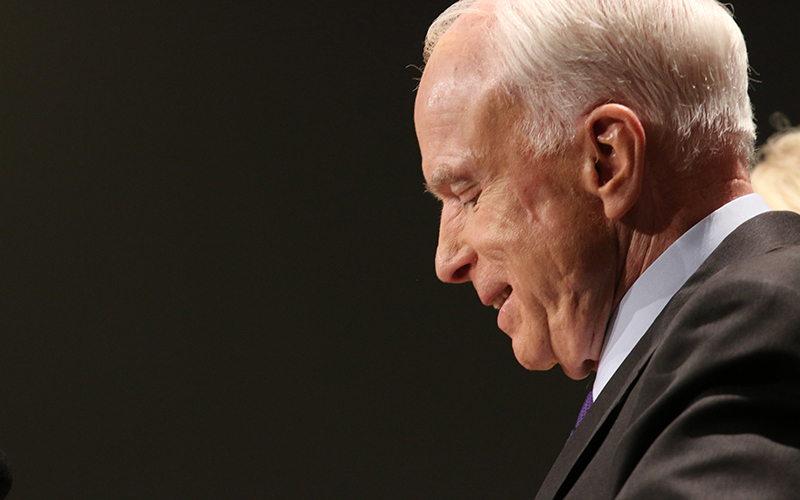 Republican lawmakers have also taken McCain’s side. Sen. Johnny Isakson, R-Georgia, told Georgia Public Broadcasting that Trump’s comments were “deplorable.” Others, like Senate Majority Leader Mitch McConnell and Sen. Martha McSally, R-Arizona, tweeted praise for McCain without mentioning the president’s remarks. Others wondered what Trump hoped to get from attacking a man who died seven months ago. Scott Talan, an American University communications professor, said Trump doesn’t seem to be able to stop himself. “We all have these things in life that bug us, that might annoy us or might upset us, including people,” Talan said. “But do we talk about them all the time? Do we talk about them when we’re supposed to be doing something else? Usually not. “The president seems incapable of any normal sort of bodily or human control over what he says and thinks,” Talan said. Ornstein, who called Trump’s comments “shocking and ridiculous,” sees a different motive: jealousy. “The fact that McCain got that acclaim and he didn’t weighs on him,” he said. – Cronkite News reporter Alyssa Klink contributed to this report.